Hi everyone! I just got a great email from Tarte Cosmetics today! They are having a Friends and Family sale where everything on their website is 40% off, plus free shipping on any order over $60. Tarte is an eco-friendly company that is cruelty free and healthy. They are 100% free of parabens, petrochemicals, synthetic fragrances, sulfates, and phthalates. This is a fantastic deal if you want to try some Tarte products or already have favorites you want to stock up on. My personal favorite are the Lights, Camera, Lashes Mascara; eyeshadow palettes; and Park Avenue Princess Bronzer. 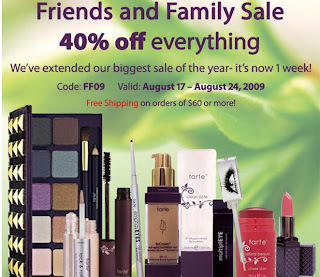 4 Responses to Tarte Friends and Family Sale! >Thank you! I'll have to try some! >hiya 🙂 just wanted to et you know that i love your YT videos and Id love for you to visit my blog which has reviews/info about cruelty free products aswell as many natural products. >Thank you —I have been trying to find some makeup that is free of harsh chemicals. >Hey, we need a new blog entry out here!